I was so sure it was going to rain. The radar showed angry red patches of precipitation moving east-northeast from Virginia towards the District. As I walked around the Capitol Reflecting Pool, a brisk south wind rustled the trees, and gray cumulonimbus clouds loomed in the west*. But it didn’t rain. It got dark and gray and windy for about half an hour — then the sun came out, the wind died, and the clouds continued to the east. Radar showed the rain starting just north and east of the District. A few hours later, the same system brought showers to New Jersey. It’s not the first time that I’ve predicted inclement weather “in the next few hours” based on similar observations, only to be greeted a little later with a clear sky and nary a sprinkle. 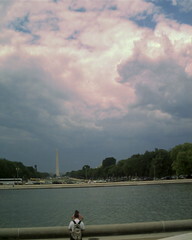 There’s something about DC, some kind of weather bubble, that repels precipitation from weaker storms. Maybe it’s a higher dew point caused by the urban environment? Is there something about the topography of the area, or the convergence of the Potomac and Anacostia rivers? Any meteorologists out there have clues? * The general rule for approaching storms in the Northern Hemisphere is that with the wind at your back, low pressure is to your left.